I’m happy to see you on this page about Hungarian goulash. In the next couple of minutes I’ll introduce to you the most famous Hungarian food. I’m sure that you have already heard about this sensational food, but please allow me to extend your knowledge about Hungarian goulash. This traditional Hungarian food is around 300 years old. 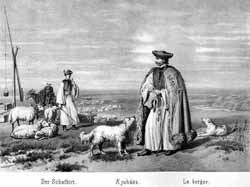 Originally the goulash was the food of poor shepherds. Shepherd in Hungarian language is “gulyás” that’s why we call this type of food goulash (made by “gulyás”). Mainly it was made from red meat like beef, lamb, and pork. Later as this food reached the high society they have made goulash also from wild meats e.g. wild boar, deer, rabbit etc. Nowadays we are cooking goulash from different types of meats. In my family the most common is to make goulash from beef or chicken. The most traditional Hungarian goulash is made from beef. The main ingredients are meat, onion and paprika. It is worth to mention the more goulash you cook, the better it is. So, let’s start with the recipe of the most traditional Hungarian goulash. This recipe is the so called “official” recipe of Hungarian goulash, but after this I will tell you which way we found the best to cook it. The knuckle makes the most delicious beef stew. 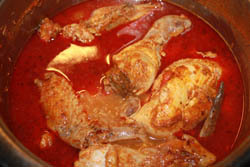 It is a masterpiece of traditional Hungarian cuisine and like ragout, has rich juices, not too thick and not too thin. If the meat is old and needs time to become tender, add the paprika only at the end. Use the tender cuts of beef, such as chuck, shank or chump. It’s alright to use mixed cuts and add some kidney and liver as well, but is not so important, you can cook goulash without these innards. 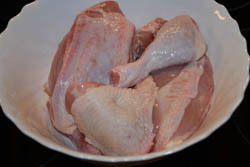 Remove the membranes and clean the meat properly, then cut it into cubes. I would like to give you a practical hint. It is very important to cut the meat perpendicular its fiber, otherwise the meat will be tough! 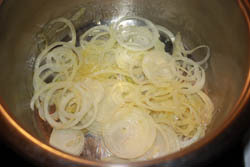 Slice the onion and fry the rings in hot grease, sprinkle with ground paprika and add the beef. As I mentioned fry for a couple of minutes, then add enough water to cover, and then simmer for about 2 hours, with the lid on. Meanwhile, add green peppers and tomato (or tomato juice). 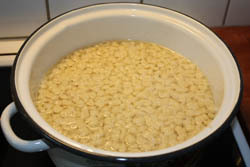 If the liquid boils away, add some more water until the meat is completely tender. Finally reduce and simmer for a couple of minutes. And now, this is the way we cook it at home. Fry the sliced onion until it starts to be transparent. It is difficult to explain, but I try. You should fry/stew the onion until it is not yet soft and its color is like glass. Put the meat on it just after. There will be a lot of water coming out from the meat. You can stew it until almost all water is evaporated. By this time the meat will lose its original red color as it turns into white. Put the paprika on it now, mix them up quickly and add water. You can fill up the pot with water until it overruns the meat. Put the rest jut now in it. If you want to increase the taste just add some red wine. 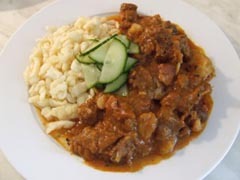 This type of Hungarian goulash can be made also from pork. The preparation is exactly the same as goulash from beef. What ingredients do you need for 4 poeple? Salt both sides of the meat pieces. Clean the onion and slice it and also slice the bacon. Put the bacon and onion in a pot and fry the onion in the fat of the bacon. If you don’t want to use bacon you can use some oil instead and the onion should be fried on it. After the onion is fried take the pot from the stove and put the paprika on it and mix them up and immediately put 2 tablespoons of water in it. If you put the paprika on the onion, when it is on the stove, the paprika can be easily burnt and it will be bitter. Try to avoid this as your Hungarian goulash and also the Hungarian chicken paprika won’t be tasty. After you put the paprika and you added the water you can put them back on the stove. Fry both side of the meats and add 1 dl/0.2 pints of water. Add the cleaned and sliced green paprika. Simmer with the lid on until the meat is tender. If the water evaporates before the meat is tender enough, you can add 1 or 2 tablespoons of hot water. Finally put the fine sliced tomato and the crushed garlic. Simmer it for couple of minutes with the lid on. Mix the sour cream and cream with the flour evenly and pour it on the meat. Boil it until the paprika juice is collected on the top of the chicken paprika. Don’t stir the goulash as the chicken meat will be broken! There is a typical garnish which fits with both Hungarian goulashes. 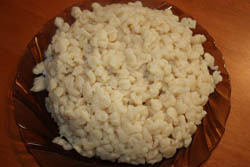 This is the so called “Galuska” – Little Hungarian Dumplings. It is very easy to make. If you don’t have time or you don’t want to make “galuska” you can cook some pasta. Pasta is also fits very well with goulash. 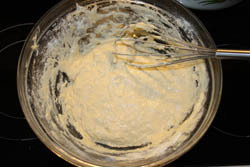 Put the flour, eggs and the salt in a deep dish and mix them up and add little water and mix them until you have dough. 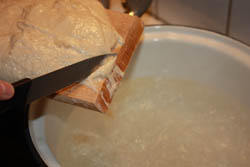 Leave it for 30 minutes and put it on a wet chopping board and tear the dough with a knife from the chopping board into salted and oiled (1 table spoon) boiling water or use this tool on the picture (Galuskaszaggató). We call these small peaces of dough as “Galuska”. Stir the “galuska”s, when they are in the boiling water, as it will help to avoid not sticking them together. 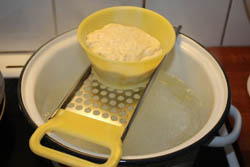 Take out the “galuska”s with a strainer from the pot after 1-2 minutes after the second turn of boiling. Let the water drop downstream and rinse it with hot water. I hope your first Hungarian goulash was a great success. I’m always happy to hear about your success stories, so please share it with me. If you have questions or you have some problems with the recipes, please contact us and I’ll help you.